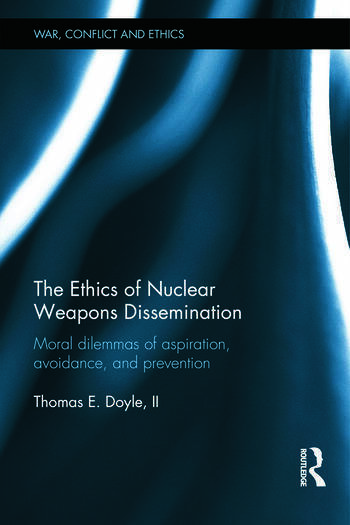 This book examines the moral dilemmas of nuclear dissemination, and the justifications of both nuclear pursuit and avoidance by contemporary states. Applying Constructivist methodologies and moral theory, the author analyses a core set of moral dilemmas that ensnare decision-makers amongst state and non-state nuclear aspirants, as well as amongst states committed to preventing horizontal proliferation. The book shows that the character, structure and implications of these dilemmas have not yet been adequately understood or appreciated, and that such an understanding is necessary for an effective set of nonproliferation policies. Furthermore, it shows that the dilemmas’ force and political policy import are evident in the 'discourses' that diverse actors undertake to defend their nuclear choices, and how the dilemmas of nuclear aspirants are implicated in those of nuclear preventers. The author advocates a number of policy recommendations that reinforce some already made by scholars and experts but, more importantly, others that advise significantly different courses of action. The book reveals how the moral dilemmas of nuclear aspiration, avoidance, and prevention constitute the security dilemmas and paradoxes that comprise much of the 21st century security environment. This book will be of much interest to students of nuclear proliferation, international relations, ethics, and international security studies. Thomas E. Doyle, II, is Assistant Professor of Political Science at the Texas State University, USA. He has a Phd in Political Science from the University of California Irvine (2010).